The U-verse High-Speed Internet, which has similar plans to Comcast ranging from 25Mbps to 75Mbps, they also offer gigabit internet called AT&T GigaPower, but service coverage is still a bit of a mystery. Atlantic Broadband is going strong with it’s 1GBps residential and business broadband offerings in Miami including some new areas like Aventura, South Miami, and Brickell-Downtown. The residential version is called GigaEdge and carries up to 1 Gbps downstream and 50 Mbps upstream, starting at $89.99/month for new customers. The business version called Pro GigaEdge has the lowest price we have ever seen on gigabit internet for only $199.99/month with a 3-year commitment. Meanwhile, Comcast is busy developing the largest Gig-speed network in Miami which means an easy upgrade for everybody in their large service area. Pricing is very affordable; 1 gig residential service is $140/month and $300/month and up for their business-grade packages. Let us match you with the ideal provider for your internet service needs. If cost is your highest priority as you shop for a business internet package, Atlantic Broadband might be what you need. With a price of just $69.99 a month, you will have unlimited calling within the country as well as 25 Mbps internet speeds. You may have to pay a small setup fee, but even then the average price should still be lower than what AT&T and Comcast are offering. For the first year, the average price for this plan, including the registration fee, comes to about $75.00 A 25Mbps plan by Comcast goes for $99, and you’ll have to pay around $110 for a 45Mbs plan at AT&T U-verse. Not every Miami business has the privilege of choosing between the three companies. In some places, the choice is just two, while in others, you might have a single option to work with. You should make inquiries from the company to confirm whether your area is covered. Alternatively, you can check their coverage maps and see what options you have at your disposal. Comcast has both internet and phone services for businesses. Although the company network is built on coax cables which considered slightly dated, utilizing DOCSIS 3.1 technology Comcast is able to deliver gigabit speed to every home and businesess using it’s current network infrastructure. 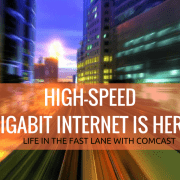 -Comcast offers business internet at speeds of between 25Mbps to 1000Mbps. -Every internet package Comcast offers comes with an affordable phone and TV service option. Reliable internet speeds for all kinds of business. Small or large, every business can have its online needs met by the packages Comcast is offering. Other features and add-ons include unlimited data, business WiFi, as well as off-site mobile access and added services for business needs such as web hosting and internet while telecommuting. Comcast’s packages are a little more expensive that what AT&T and Atlantic Broadband are offering. Comcast may be still using coaxial cables to deliver their services, but they are still reliable if you find the packages they are offering appropriate for your business. As with most business bundles, the service comes with both internet and phone services. Why not take up our free Technology Assesment to help you find the best internet plan for your business? AT&T U-verse is offering similar internet plans to Comcast but falls short on the higher spectrum with just 75Mbps maximum speed. AT&T GigaPower makes up for that, with their 1Gbps fiber-optic Internet solution, which is the best you can hope for as a business. The other upside is that this service is also quite affordable, making it ideal for a business that needs unlimited bandwidth at a reasonable price. -AT&T U-verse offers business internet at speeds of between 6Mbps to 75Mbps. -AT&T GigaPower, on the other hand, offers 1Gbps Internet, which should be more than enough for any companies. -U-verse Business Telephone: Wit this service, you can get Unlimited local calling with flexible features. AT&T’s Gigapower is clearly the best you can hope for when it comes to speeds. So, if your business requires heavy internet use, this is the way to go. This package offers great value for money proposition. Many internet plans with speeds that are just a tenth of this speed will cost you more. The phone service that comes with AT&T Uverse is not as competitive as the other providers, but still should be a solid option. The lack of information on AT&T Gigapower is a bit disappointing, we would like to see at least a simple web page dedicated for their business plans. With the fiber-optic GigaPower now in its list of offerings, AT&T is now an excellent option for businesses in need of high-speed internet services. If your area is not one of the lucky ones to enjoy GigaPower coverage, you might have to settle for ATT’s High-Speed Internet packages, which is still a solid option. Atlantic Broadband offers internet speeds of 25Mbps to 1000Mbps to small, medium-sized as well as large businesses. -The company promises to deliver reliably on the speeds it offers with each package. The internet does not come with caps on usage. -The packages also come with phone services without too much in additional charges. Ability to support business internet needs such as hosting servers. Atlantic Broadband also comes with a security and spam filter, reliable customer support, and remote access capabilities. The downside of Atlantic Broadband’s services is that they are not as widely available as Comcast and AT&T are in the Miami area. If you happen to have Atlantic Broadband in your Miami location, you will be lucky to have an affordable business Internet service, if that is what you are looking for. With its broad choice of features and high speeds, this service will do a superb job at keeping your business connected to the world. There is no straight answer as to which provider towers above the rest as a supplier of business Internet services in Miami. For one, you might not have all the three options. On the other hand, if you do, speed, price, and other factors might lead you to pick a particular provider over all others. If you want an affordable service, Atlantic Broadband is the best option, and AT&T is also worth considering in this regard. But if you want the highest possible speeds, AT&T’s fiber-optic GigaPower, Comcast’s Gig-speed and Atlantic Broadband’s new Pro GigaEdge is what you need. Finally, if you want as many package options as possible, Comcast has your needs covered. Please keep in mind that these prices and promotions always change. Also, some of the buildings may require a special build out to meet a particular plan needs. It’s best to call a company representative before you commit to an internet package. I hope you enjoyed this article. Here at iFeeltech, our focus is on providing small business with flexible IT support to improve overall productivity while minimizing risks. If you have any IT related questions or comments, please drop us a line or let us know in the comment section below. What is your experience with your current Internet provider?